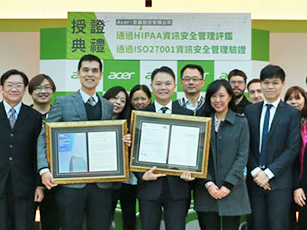 Acer’s BYOC service has recently received ISO 27001 information security certification, and also passed an independently-held HIPAA (Health Insurance Portability and Accountability Act) audit by KPMG, affirming BYOC’s information security management system (ISMS) is compliant with international standards, and also ensuring that healthcare solutions leveraging the Acer Open Platform (AOP) are compliant with US regulations when processing, storing, and sharing Protected Health Information (PHI). Through information security procedures and technology such as access control, enhanced encryption, and physical and environmental security controls, customers and partners can rest assured of the confidentiality, integrity, and usability of data when transmitted or stored through the AOP. This is especially important for remote healthcare, medical, and health monitoring solutions.